March 09, 2018, 3:00 p.m. In the last year, Americans have become more skeptical of Russia and its intentions – but whether or not it interfered in the U.S. election remains a matter of partisan debate. 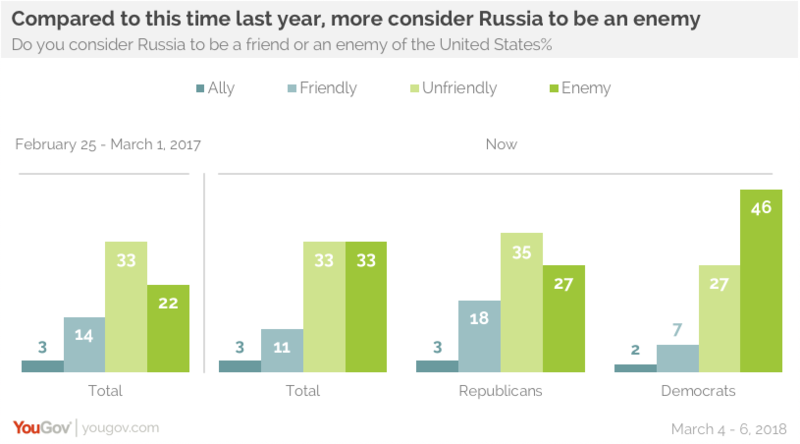 In the most recent Economist/YouGov Poll, two in three Americans say Russia is at best unfriendly, with a third saying it is an enemy, up sharply from a year ago. Republicans continue to be more positive in their assessment of Russia, while Democrats have become more skeptical. 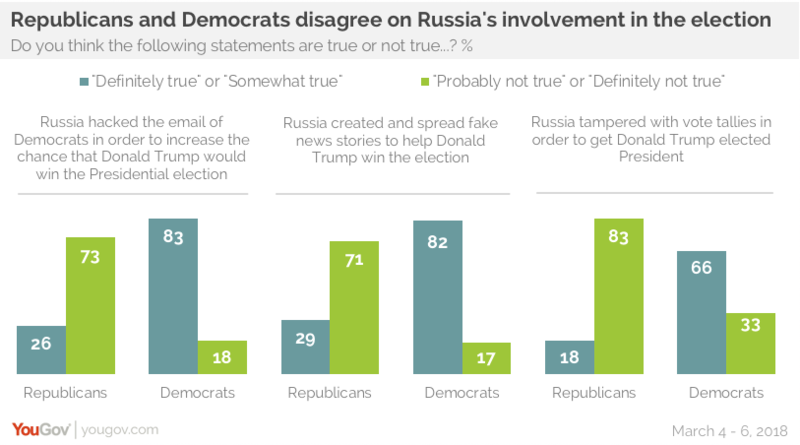 The percentage of Democrats describing Russia as an “enemy” has risen 14 points from a year ago. Much of this has to do with the Democrats’ belief that Russia is in part to blame for their party’s loss in the 2016 presidential election. They overwhelmingly say Russia hacked the emails of the Democratic National Committee and spread fake news to help Donald Trump win. Most Republicans don’t believe these things happened. 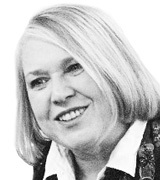 Both of those alleged actions are the subject of investigations both public and private. Democrats overwhelmingly say fake news spread by Russia was at least somewhat likely to have affected the results of the presidential election – just under half (46%) say that it was very likely. Republicans disagree – except for those Republicans who think that Russian-sponsored spreading of fake news actually took place. A majority in this group believe it was in fact likely that the effort did affect the election outcome. Two out of three Democrats also claim Russia tampered with vote tallies on Election Day to help the President – something for which there has been no credible evidence. More than seven in ten Democrats but just 17% of Republicans believe a member or members of the Trump campaign did something improper in their dealings with Russia before the inauguration. Fewer on both sides think the President himself did. While Republicans oppose the naming of Special Counsel Robert Mueller in the first place, they reject calls to fire him, although narrowly. 27% of Republicans would fire Mueller, 35% would not. But just as many say they aren’t sure whether or not Mueller should be fired. Republicans and Democrats hold different views on a number of countries, not just on Russia. 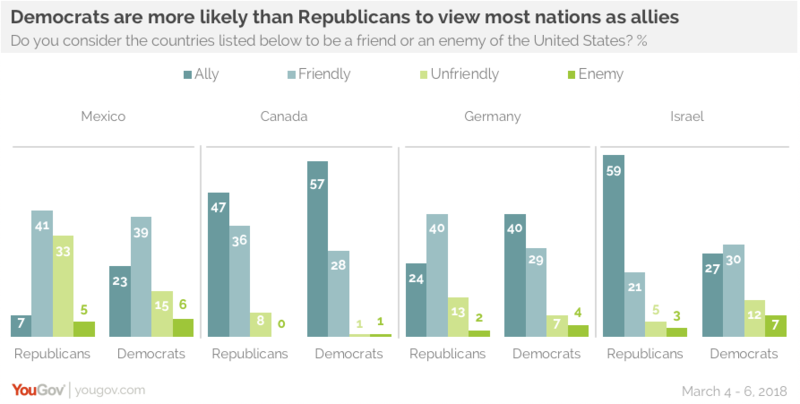 Nearly twice as many Republicans as Democrats regard Mexico as unfriendly or as an enemy. They are ten points less likely to call Canada an ally, and 16 points less likely to say that about Germany. But they are twice as likely as Democrats to view Israel as an ally. There is much less partisan disagreement on the belief that North Korea is an enemy and that South Korea is friendly.